Hotel Roemer is a boutique hotel situated in 2 historic 18th-century mansions in a quiet street, only 400 metres from Leidseplein in the heart of Amsterdam. It includes a private garden and rooms with a Nespresso coffee machine, flat-screen TV and an iPod docking station. Vondelpark is 200 metres from the hotel. Tram stop Stadhouderskade is less than a 5-minute walk away and provides easy access to Amsterdam Central Station. The Rijksmuseum and Van Gogh Museum, on Museum Square, can be reached in less than a 10-minute walk. The fashionable P.C. Hooftstraat is 350 metres away. 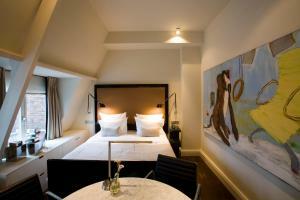 Each of the elegant air-conditioned rooms is equipped with a minibar, a desk and a DVD player. The modern bathrooms have either a rain shower and/or a spa bath plus The Spa Collection toiletries.